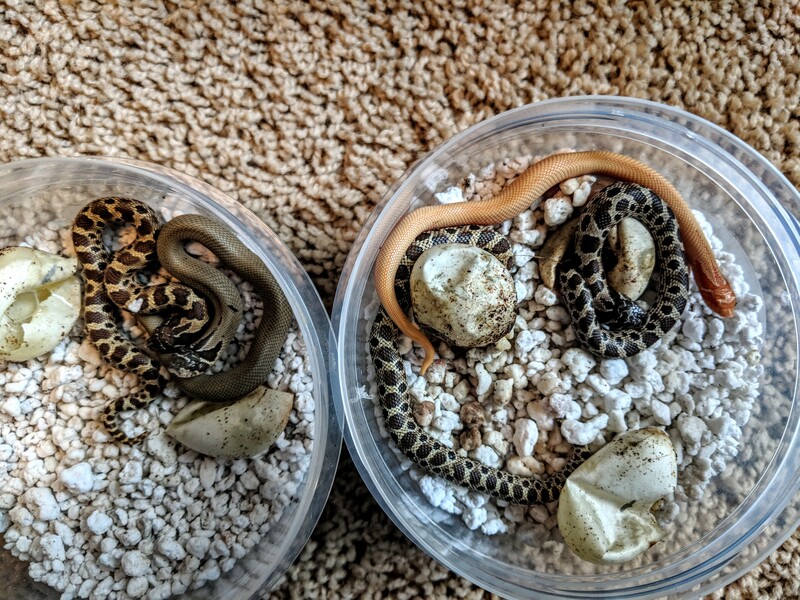 These are the first snakes I've hatched since I was a kid (which was longer ago than I'd like to admit). I bought my daughter a pair of Hognose a few years ago. She sort of lost interest in them eventually, so I took them over. This year they were big enough to breed so I paired them up. I never saw them lock up, although the male was eager enough. I didn't think he was successful, but the female laid a small clutch, and here they are, finally all out of the eggs. The odds for the albino super were 1/16 so I was happy to get one in only five good eggs. Last edited by eminart; 08-06-18 at 07:10 PM..
Beautiful clutch! I love the orange one. Is that the super albino? They look awesome Em! Great job sir. Is that the super albino? Yep. My daughter has actually asked to keep that one. She's a little older now, so I told her she can have it. Worst case scenario, I sell it at a later date if she decides she doesn't want it anymore. Congrats on the new hatchlings. Now comes the fun part, getting them to eat rodents. Did you use an incubator for the eggs? A small clutch with awesome results. Congrats! Did you use an incubator for the eggs? I used an incubator I made a few years ago for geckos. Any updates on these little ones? Would love to know how they're doing!